WaterBike is a kind of bicycle to pedal on water. 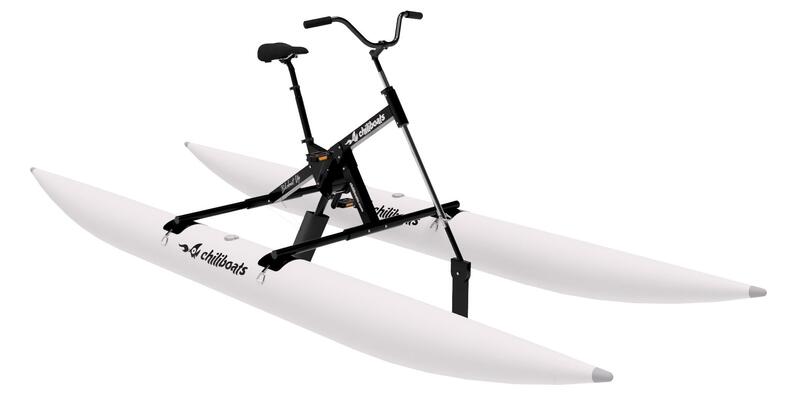 We offer two models of waterbikes: the Bikeboat Rec (Recumbent / Reclining) and Bikeboat Up. Both models available for immediate delivery. 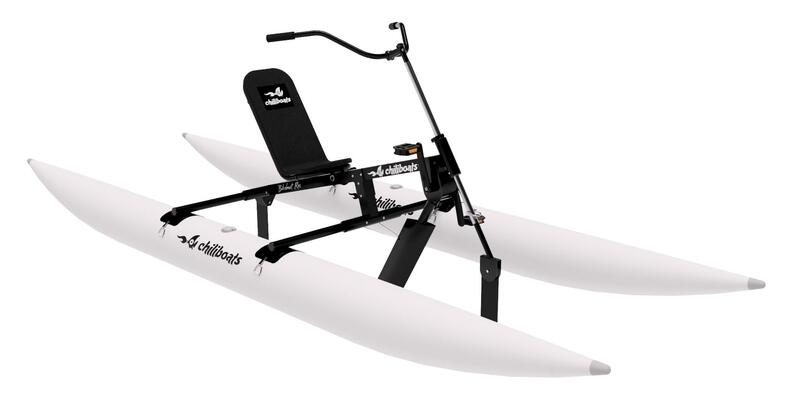 What is the difference between Recumbent Bikeboat and Bikeboat Up? The position of Recumbent Bikeboat offers greater comfort to the back. Its ergonomic seat offers greater comfort by the way of sitting and keeping your back fully supported. It makes the Bikeboat Recumbent much more suitable for pedaling over long distances. Besides, due to the user being in a lower position, is less susceptible to winds. But there are people who have a preference for Bikeboat Up because it is similar to a conventional bike. In terms of speed and performance, both are equivalent and use the same propulsion system. You can get up to 2 times the speed of a Stand Up paddle. The maximum speed of new models is about 15km/h, depending on your condition you can keep a pace of 6 to 9 k/m without much effort. Today, we can state with full conviction (based on tests) that our Bikeboat is the FASTEST Waterbike on the market! Yes, both models can go reverse. You just need to peddle backwards. Is there Bikeboat model for 2 places? Chiliboats proposal is to offer maximum performance (high speed and maneuverability). Just as the high-performance bikes are made for one person, the Bikeboat was designed for a single person. What is the total weight of the Bikeboat? Both models weigh just 42 lbs. Further technical information is available on each product page by clicking on the “Specifications” button. What is the maximum weight it can carry? The maximum recommended weight of the user is 120kg (265lbs). In fact the boat can handle more weight than that but we put a safety margin for a comfortable and safety ride. Can I use it on sea water? The components of the Bikeboat were designed for the marine environment so they can be used in salt water. The main frame is made of aluminum. The mechanical components are made of stainless steel. For new models (2017) we are using a resistant anodizing finish in black: no peel off, tougher than any type of paint). With basic care your Bikeboat will last several years. What is the material of Bikeboats? The structure of Bikeboat is made of aluminum, to give lightness and the mechanical components are made of stainless steel. For new models (2017) we are using a resistant anodizing finish in black: no peel off, tougher than any type of paint. It is a lightweight boat, but quite robust. What is the material of inflatable floats (pontoons)? Floats are made with reinforced PVC fabric, resistant to extreme conditions. The outside PVC layer offers abrasion resistance and the inside high strength polyester fabric offers dimensional stability, tensile and tear strength. Our inflatables are made from the same material used in banana boats and boats for rafting. What happens if a float gets punctured? How to fix it? It is very unlikely to get punctured, but if that happens, it can be easily repaired with the repair kit that came with the Bikeboat. What special cares do I need with my Waterbike? The Bikeboat was designed to require minimal maintenance, which consists of a fresh water shower after every use, especially if the boat is used in salt water. The propulsion system uses a kind of crown and pinion transmission system and requires no adjustment/tightening. It requires only to be lubricated every 3 months or 50 hours of use, whichever comes first. The service is simple and can be done even with the boat fully assembled. For end users the warranty is 6 months. The warranty does not cover accidents, abuse or modifications. For commercial use, we offer 3 month warranty against manufacturing defects. 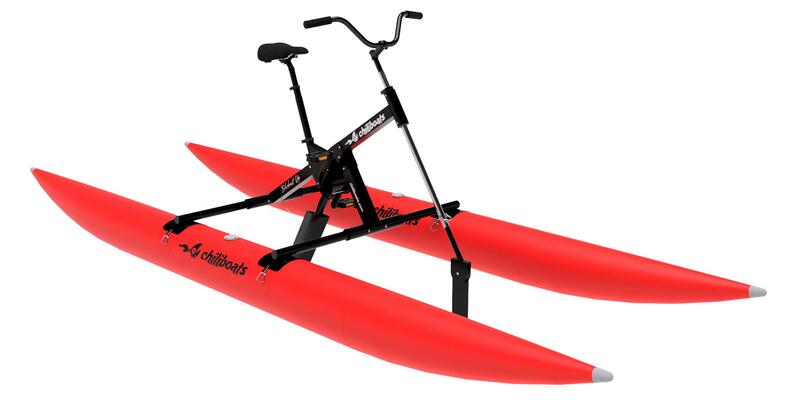 What are the advantages of riding a Waterbike compared to a terrestrial bike? First, the person needs no balance. Even those who cannot ride a bike, they can use our Waterbike. Sensation of freedom in all directions: no need to follow the crowded bike lanes. You can take any direction. Pedaling in water offers less risk of injury since the effort is continuous, damped and without vibration. What is the advantage of the Bikeboat compared to those inflatable kits that are attachable to a bicycle? Our Bikeboat is a complete product ready to use, you do not have to adapt a bike. In addition, there is a huge difference in quality, design and most importantly, water performance (our Bikeboat is faster). Bicycles are not made with suitable material to resist corrosion, especially if the boat is used in salt water. This way, when using a bicycle under these conditions, it will undergo premature degradation in its parts. In addition, with these kits there is no possibility to reverse, which is a very important feature. All components of the Bikeboat are designed for the marine environment, that is, they resist salt water, which is not the case with a land bike. In addition, our inflatables are much higher than those used in these kits (which use a thinner PVC, which is lighter and cheaper, but with lower durability and durability). Our inflatable floats are manufactured with high strength nautical canvas that withstand extreme conditions. It’s the same material used on rafting boats, which are made to withstand bumps in rapids. What about Bikeboat’s stability? Is there any risk of falling into the water? The catamaran configuration provides huge stability and is virtually impossible for you to fall into the water. Unlike the Stand Up Paddle boards, the Bikeboat does not require balance. Do you need to have specific skill? No way. The Bikeboat is suitable for all people of all ages and does not require any special physical preparation or require specific skill. What are the appropriate places to ride your Bikeboat? The Bikeboat is ideal for any bodies of water: ponds, lakes, rivers, dams and can also be used at sea (out of the surf region). How long does it take to receive my Bikeboat? Consult us by chiliboats@chiliboats.com (We have Bikeboat Up & Bikeboat Rec available for immediate delivery!). We use FEDEX and the delivery time is according to your region. In general it takes around one week, after the pick up by Fedex. How is the delivery of Bikeboat? Delivery is made by FEDEX (air freight, door to door, International Economy Service or International Priority Service in specific areas). Yes, all regions covered by FEDEX. The Bikeboat can be assembled in less than 5 minutes. 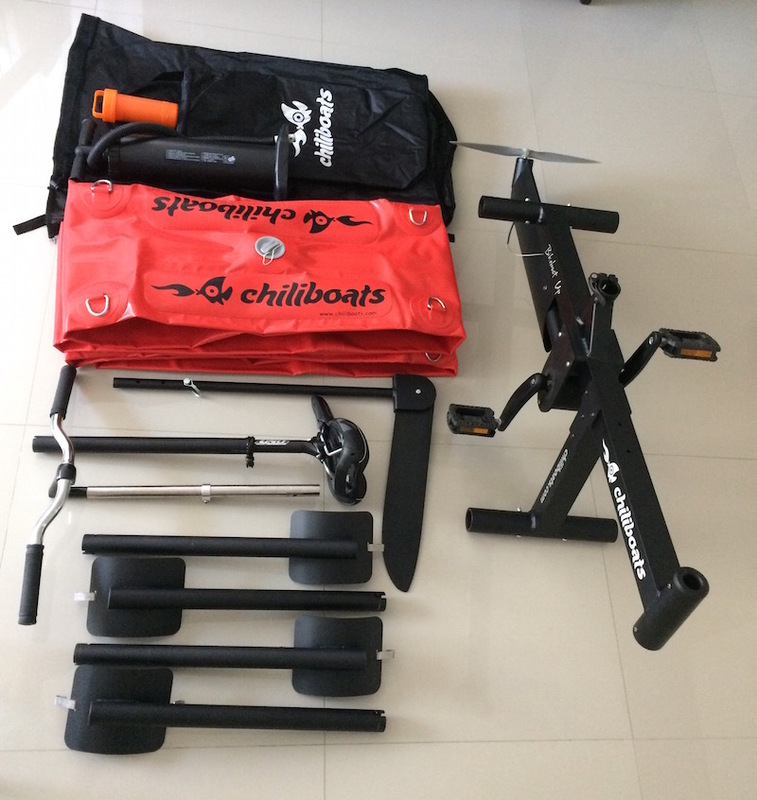 Is it difficult to assemble the waterbikes? The assembly/disassembly is easy. Just follow the steps in the instruction manual accompanying the Bikeboat or watch the video for Bikeboat Up and the video for Recumbent Bikeboat. 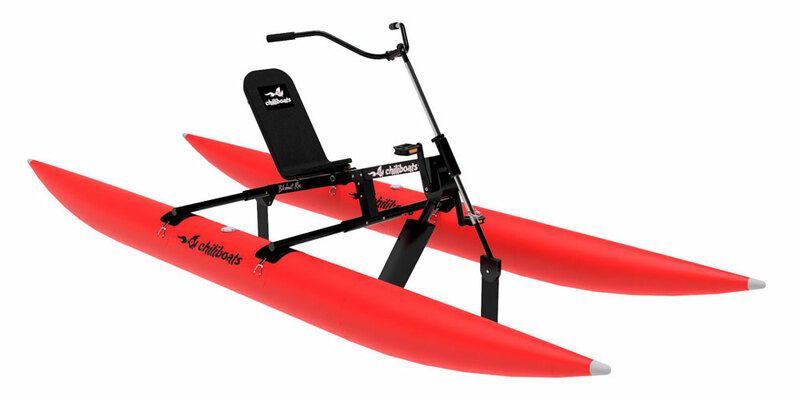 What accessories accompanying the Waterbikes? Each Bikeboat comes with the following accessories: backpack and double action hand pump. Does the Bikeboat use standard bike components? Bikeboat Up uses standard bicycle components for the seat, seatpost, handlebar, handlebar stem, pedals and cranks. The Recumbent Bikeboat uses standard bicycle components for the handlebar (from the 2017 model), handlebar stem, pedals and cranks. Both the Bikeboat Up and the Recumbent Bikeboat are delivered with very well selected components, good quality for comfort and performance during use. However, if you want to modify any of these components, according to your preference, you can purchase them in bikes stores. You can also add basket, bottle holder, and everything else your imagination allows. What is the size of the Bikeboat box? Bikeboat Up: box dimensions are 108 x 41 x 33 cm (gross weight is 26,2) kg. Bikeboat Rec: box dimensions are 130 x 41 x 31 cm (gross weight is 28,6) kg. The advantages are reduced shipping costs and small space required for storage. What are the Bikeboat dimensions fully assembled? Length 381 cm (12’6″) and width 127 cm (50″). How is the Bikeboat disassembled? Check here a picture of the Bikeboat Up disassembled. Do I need any license to use the Bikeboat? It does not require license. Since the Bikeboat is not motorized, it fits in the same rule of kayaks and Stand Up Paddle boards, requiring no license. For rentals, you need to check in with local authorities. Can I use Bikeboat for sport fishing? Yes, it is a great platform due to its stability. You can support a fishing rod between the connecting bars of your Bikeboat. Are there gear shifter in the Bikeboat? The gear ratio is fixed and suitable to the propeller used to ensure maximum thrust with minimal effort in the normal pedaling conditions (typical cycling cadence). What are the forms of payment to purchase the Bikeboat? For international purchase we accept international bank transfer (wire transfer) and PayPal (additional cost of 6,9%). What colors are available for the waterbikes? The structure is black and floats are available in yellow, red and light grey (almost white) color. Consult us previously to check the colors available. Where is the Chiliboats company? The company was born in the city of Rio de Janeiro and is now based in Santa Catarina state.